Garces Memorial High School welcomes international students. We issue I-20s for students seeking a diploma (F-1). 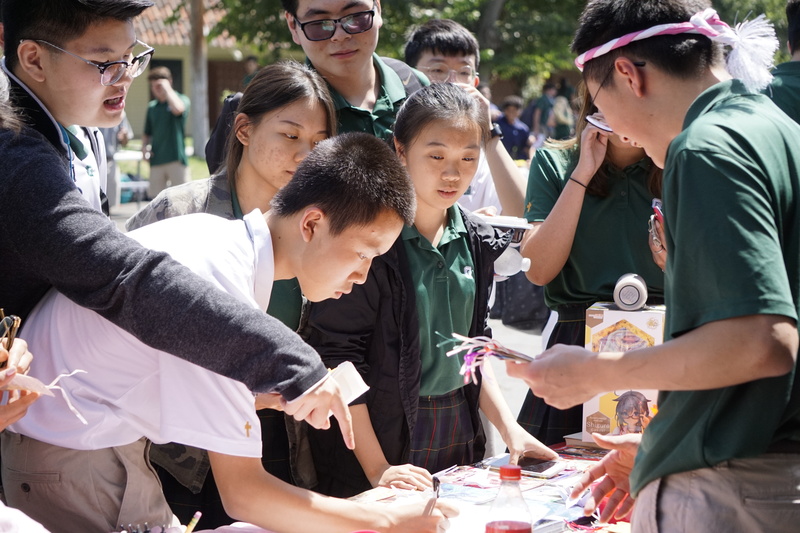 Recent international students have attended Garces from Canada, Korea, China, Czech Republic, Thailand, and South Africa. Garces Memorial High School is Bakersfield, California's premier High School. Garces Memorial is an academically challenging, college preparatory, co-educational Catholic high school, founded in 1947 by the Christian Brothers and Dominican Sisters of St. Thomas Aquinas. Today it is operated by the Diocese of Fresno and staffed by a lay faculty and administration who are inspired by their Catholic faith to minister to the needs of the student body. Garces students develop an intellectual like, a talent for critical thinking and passion for learning that sustains them through college and well beyond. All students receive individual college counseling. Garces Memorial’s curriculum, values and culture shape young people who are exceptionally well-prepared for the next phase in their educations. College Preparatory Program – Our college preparatory program is based upon the University of California and California State University academic requirements. Advanced Placement and Honors Program – Garces has a comprehensive selection of course offerings which include honors and AP options. California Scholastic Federation – This program exceeds the recommended course work of our College Preparatory Program. It requires a minimum number for core courses. Students must meet state mandated requirements to participate. Applications are available on the Garces campus. Submit an official copy of a bank statement with sufficient funds for tuition and other fees. Following the interview, a decision will be made regarding admission to Garces Memorial High School. The decision is made based on the student application, Skype interview, availability of host families and the fit of the student. The accepted decision will be emailed to the student. If the student is accepted they will receive an International Student Agreement. The accepted student has two weeks to return the agreement to Garces. Once the agreement along with the $425 registration fee is turn in the Garces will request an i-20. REGISTRATION FEE: $425.00 (non-refundable) paid before I-20 is issued. Registration Fee – This fee covers the setting up of computer records, implementing programs, administering and scoring standardized tests, and processing applications. In addition, this fee includes costs for grade reports, student ID cards, admission to specified school events, and graduation fees. Also included in this fee is the annual yearbook and student activities card. This fee is payable each year at the time of application and is non-refundable. TECHNOLOGY FEE: $550. Every student is provided with an iPad, apps, training, and technical support for the school year. iPAD CASE FEE: This fee is included in the technology fee. Tuition and fees are to be paid in full before the start of the academic year. Late or delinquent payment of tuition can result in fines or dismissal from school. REFUNDS – All tuition and fees are non-refundable. A written statement from the parent or legal guardian is required to withdraw a student from school. Yes, Garces Memorial High School a member of the Diocese of Fresno does issue i-20’s. How many international students are at GMHS? About 10% of our student body is international. (45 of 540 students). How much does it cost for an international student to attend GMHS? For the 2019-2020 school year, it will cost about $16,500. Full tuition (non-refundable) is due by July 1, 2019. Tuition must be paid for a full year even if the student takes a leave of absence and then returns to school. Can I apply for the Spring Semester? Yes, but we only accept grade 9 and grade 10 applications for the Spring Semester. Does GMHS have an ESL program? Yes. But our ESL program is supplemental and we expect a student’s English proficiency to be high enough to be successful in our mainstream college preparatory classes. No, but you can submit a TOEFL score as extra documentation for your English proficiency. GMHS is look for students placing in the 50% with a mean score of 60. Can I take the SLATE test in my country? What is the minimum score on the SLATE or TOEFL exam to be accepted? We do not have a minimum score for acceptance. We do however expect the proficiency to be high enough to be successful in our mainstream college preparatory classes. Does GMHS offer SAT/ACT prep classes? Yes. You can find out more information from our counseling department. Can I play sports at GMHS? Yes but you must complete paperwork to meet state regulations with the GMHS Athletic Director. No. The student must be a full-time student while enrolled at Garces Memorial High School. Can I live with a family member while attending GMHS? Yes. All international student must live with a host family or family member while enrolled at GMHS.